SKYbroadband’s going faster and is priced lower than ever with free HD cable TV subscription thrown in. High-speed, reliable internet access and fastest access to widest content accelerates your need for speed with this limited offer faster speed at low price with plans from 25Mbps up to 300Mbps that now include FREE cable TV subscription plus a FREE SKY On Demand box that lets you access a wide array of movie choices ranging from drama, action, suspense, and comedy straight from your TV. Yes, that’s versatile plans, faster speeds at reduced price points with freebies to up the ante that won’t compromise your need to stay connected, surf all day and watch your favorite local and international TV shows and series. Areas of coverage include Makati, Mandaluyong, Paranaque, Pasay, Pasig, Quezon City, San Juan, Alabang in Metro Manila, plus Cebu, Davao and Laguna. 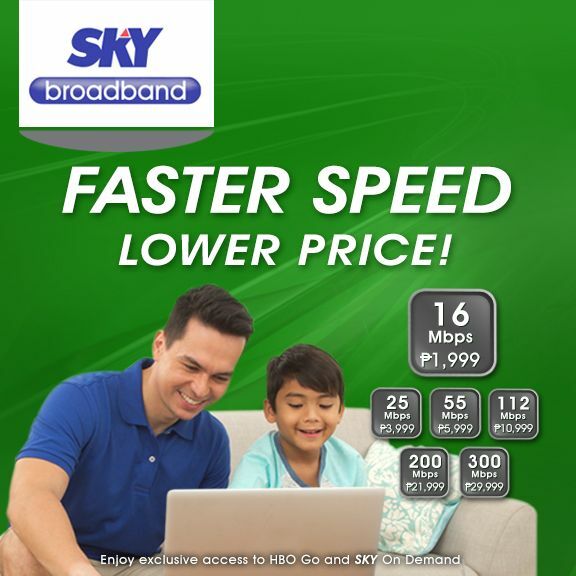 It will be rolled out in more SKYbroadband areas in the coming weeks! SKYbroadband’s gone low so you can stay home! Come and get it! Call SKY at 3810000 for plans and fees best suited to you and your family now.